The Safavid Shah Abbas converted large pieces of Safavid land traditionally granted to tribal chiefs as assignments into crown lands that he taxed directly. This new military force was trained on European lines with the advice of Robert Sherley (http://www.jstor.org/pss/4299681). 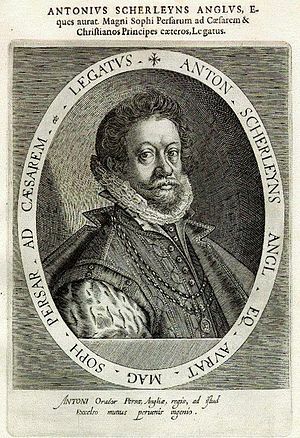 Sherley was an English adventurer expert in artillery tactics who, accompanied by a party of cannon founders, reached Qazvin with his brother Anthony Sherley in1598. In a short time Shah Abbas created a formidable army, consisting of cavalry, infantry and artillery. Robert went with his brother Anthony to Persia in 1598. Anthony was sent to the Safavid Persia from 1 December 1599 to May 1600, with 5,000 horses to train the Persian army according to the rules and customs of the English militia. He was also commanded to reform and retrain the artillery. When he left Persia, he left Robert behind with fourteen Englishmen, who remained in Persia for years. Having married Teresia (aka Teresa), a Circassian lady, he stayed in Persia until 1608, when Shah Abbas sent him on a diplomatic errand to James I and to other European princes, the Persian embassy to Europe (1609–1615). He was employed, as his brother had been, as ambassador to several princes of Christendom, for the purpose of uniting them in a confederacy against the Ottoman Empire. After Shah Abbas ousted the Portuguese from the island of Hormuz at the entrance to the Persian Gulf in 1622, Bandar Abbas (Port of Abbas) became the center of the East India Company’s trade. But Later the Dutch East India Company received trade capitulations from Shah Abbas. The Dutch soon gained supremacy in the European trade with Iran, outdistancing British competitors. They established a spice-trading center at Bandar Abbas. In 1623-24 Shah Abbas I launched an offensive against Ottomans and established control over Kurdish territories, Baghdad and the Shi’a Holy Cities of Najaf and Karbala. In the 16th and 17th centuries, Persia tried to obtain support among European nations against the expansionism of the Portuguese and the Ottoman Empire. Since France was tied into a Franco-Ottoman alliance alliance however, the Persian embassy to Europe of 1599–1602 and the Persian embassy to Europe of 1609–1615 avoided France. A Capuchin missions was however established in Ispahan under Pacifique de Provins in 1627. Relations took an official turn under Louis XIV and Colbert, when Colbert founded the French East India Company in 1664, and subsequently asked Lalain and Laboulaye to go to Ispahan and promote French interests in Persia. The Shah welcomed them as he was delighted to be given an opportunity to counterbalance English and Dutch influence in his country. He provided a three-year exemption from customs duties, and gave France the same privileges as other countries. Further, a trading post was given to France in Bandar Abbas. Wishing to reinforce exchanges, the Shah sent an Embassy in 1715, led by Mohhammad Reza Beg, the Persian embassy to Louis XIV. The embassy visited king Louis XIV and obtained a new treaty of alliance signed in Versailles on 13 August 1715. Contact were then interrupted with the fall of the Safavid Empire in 1722 and the subsequent troubles, until the end of the century. Lady Sherley: the First Persian in England? …journey published by one of Sir Anthony Sherleys men, two pamphlets commissioned…exceptions to this rule, as in Sir Anthony Sherleys autobiographical account of…1. Sir Thomas Sherley. 2. Sir Anthony Sherley. …Unease in Eden,” in Nicholas Canny Anthony Pagden, eds., Colonial Identity in the…Simpson, eds. (New Haven, 1935, 7:54-55. 57. Sir Henry Mainwaring, “Of the Beginnings…Discours of the Turkes by Sir Thomas Sherley,” E. Denison Ross, ed. (ca. 1607), in. 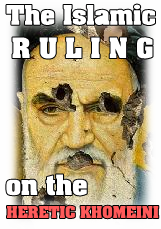 ← How did the Savafid Kingdom turned most Sunni Iranians into Shia? Hello. It is my understanding of the history that you have half of the story. The other half is that they then used the Iranians against the Ottoman empire and had it destroyed. They used Iranians, Arabs, and Turks to kill one another so they could not destroy and take over the Europeans. The tactic is still being used today in separating all of us into little groups – so we would be easily managed and dealt with! God Indicates that there is only One-God and one religion regardless of what each one of us thinks or wants [42:13][2:62][5:69] …. … And that Non of us has to answer nor is responsible for anyone else, on the day of judgment! We all have been born to a set of parents who had different background and religion and needs and …, and we all have been facing different circumstances throughout our lives. We are all very different from one another! Which is OK!!! The days of my way only for all are when we are about 5 or 6 years old. There is only one IRAN and ultimately one WORLD that we need to share! We need to stop helping Brits, French, German, ….. and all others in dividing us and using us against one another! Lol shah abbas is considered a legend in iran. If it wasn’t for his bravery, iran would’t exist. iran would be Iraq, Afghanistan,and Turkey. May god bless this Iranian brave soilder. Safavids were Persian my friend. Tabriz has always been a part of Persia. Azerbaijan has been a persian state for thousands of years. Only in recent russian expansion were a minority of Azeris separated from Iran. Safavids were persian turks who also had a kurdish background as well. They adopted farsi as the main language of their courts as well. Being Persian does not mean you are only a Fars. Turks Fars Kurds are all brothers. We all come from the same Arian decent and migrated to Asia together and are all Persian. Don’t let western ideology, individualize us to a point that we are separated weakened and have lost our unifying history. You have mixed the truth with falsehood. While it is true that Azerbaijan was and is part of the Iranian land, yet this doesn’t change the fact that the Safavids were Azeri Turks, they were as Turks as the Iranian Azeri today’s who consider themselves NON-PERSIAN IRANIANS. All historians agree to that, and some historians even argue that the Safavid clan is originally from Iranian KURDISTAN, now you gonna tell us that KURDS are PERSIANS too? ALL the nations you mentioned are IRANIAN, but not Persian, by doing what you do (a typical fashist Persian tactic) is stripping of other non-Persian minorities of Iran of their ethnical minority! It’s like calling an English man a GERMAN just because ORIGINALLY the Germans moved to the British island … what a load of Tosh. Many of your historical facts are incorrect. I left 1 comment and it says “Awaiting Moderation” … so I can’t take your website seriously and will not leave a 3rd comment if that’s the kind of “dialogue” you want to have. You can’t control a debate and engage in a debate – either you open up your comments or many people will feel the same. The Safawis were of Azeri origin, Azeris consider themselves turks and the Safawis originated from Anatolia, these are facts.